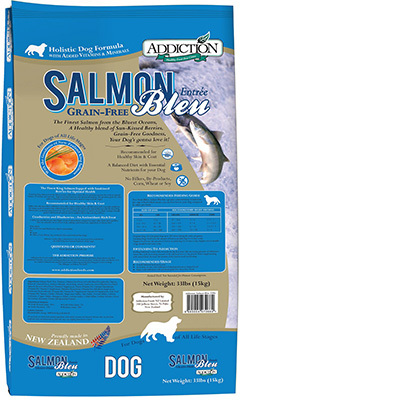 Addiction Grain-Free Salmon Bleu is a mid-priced dry dog food with overall good quality. This product has no controversial ingredients, including zero artificial colors, preservatives or flavors. This food is high in carbs, compared to protein and fat, but has excellent meat and fat quality. Addiction has a below-average number of recalls. The company was relatively transparent when answering our questions. Overall, Watchdog Labs recommends this food. The food has high carbs and somewhat low protein and fat, making it less nutritionally balanced compared to other dog foods we evaluated. Carbohydrates are cheap so they keep the food’s cost low and they are nutritionally useful to dogs in the right amounts. However, high amounts of carbs can reduce the much-needed meat-based protein and fat content. Salmon Meal, Dried Potatoes, Dried Tapioca, Chicken Fat (Preserved with Mixed Tocopherols), Peas, Natural Flavor, Ground Flaxseed, Dried Kelp, Dried Cranberries, Dried Blueberries, Dried Spinach, Brewers Dried Yeast, Vitamin E Supplement, Niacin (Vitamin B3), Calcium Pantothenate (Vitamin B5), Vitamin A Supplement, Thiamine Mononitrate (Vitamin B1), Riboflavin Supplement, Pyridoxine Hydrochloride (Vitamin B6), Vitamin B12 Supplement, Vitamin D3 Supplement, Folic Acid (Vitamin B9), Sodium Chloride, Taurine, Choline Chloride, Magnesium Sulfate, Zinc Sulfate, Ferrous Sulfate, Calcium Carbonate, Copper sulfate, Manganese Sulfate, Calcium Iodate, Cobalt Sulfate, Sodium Selenite, Green Tea Extract, Rosemary Extract. The average dog food we reviewed had 39 total ingredients, with 1 controversial ingredient. This product has 0 total controversial ingredients, that’s fantastic. Dog food ingredients are listed in descending order of weight. So when shopping for dog food, take a close look at the first 5 ingredients. They make up about 80% of the total weight. Addiction Grain-Free Salmon doesn’t have any controversial ingredients. ‍This product is made in New Zealand, that’s a plus. We generally recommend buying dog food that’s made in the United States, Canada, Europe, New Zealand or Australia - all known to have high quality standards and stricter regulations. ‍This dog food clearly shows the sources of its meats (e.g. salmon meal) and fats (e.g. chicken fat). It’s always good when the ingredient list shows you all animal and plant species transparently. There are no unnamed meat or fat sources and both salmon meal and chicken fat are high-quality ingredients. There are not any controversial preservatives in this food. It’s good to know that ‍not all artificial preservatives are bad. That’s because they serve an important purpose, which is to prevent food from spoiling. However, we consider 11 artificial preservatives as controversial because of their potential link to cancer and other serious health conditions. ‍This product doesn’t use any artificial colors, that’s excellent. ‍Addiction Grain-Free Salmon does not include any artificial flavors, either. Not having any of artificial ingredients is a great sign of quality. Addiction has a below-average number of recalls. New Zealand Venison & Apples Entree, canned dog food, Addiction brand, net wt. 13.8 oz/390 g, UPC Code 8 885004 070462. New Zealand Brushtail & Vegetables Entre, Canned Dog Food, net wt. 13.8 oz/390 g, UPC 8 885004 070028. New Zealand Venison & Apple Canned Dog Food are recalled due to elevated levels of Vitamin A and slight variance in calcium and phosphorous ratios. New Zealand Brushtail & Vegetables Entree, Canned Dog Food, are recalled due to elevated levels of Vitamin A and slight variance in calcium and phosphorous ratios. ‍Addiction was one of the more responsive companies taking only 2 days to reply. They were relatively transparent but did not provide detailed answers to many of the questions. Yes, at our Manufacturing facility in New Zealand. They would not provide a specific name of the veterinary nutritionist. Again, this is the above-mentioned persons whose name could not be shared. Yes. Our formulas is formulated to meet and exceed the nutritional levels established by AAFCO. Clarification was not provided. This answer is not clear because the feeding trial is different than formulating. This may be a misunderstanding on their part, or possibly intentionally incomplete. This answer suggests it's not likely open to the public but could be visited by a vendor or partnering company. What quality measures do you use to assure consistency and quality? Our products goes through rigorous QA testing and we follow strict regulations mandated by the New Zealand MOA. More details can be provided upon confirmation on how this information will be used. Addiction also manufacturers the Wishbone dog foods at this facility.